The Buddhist scholar and master, Shantideva. Click to enlarge or click here for more high resolution Buddha images. Shantideva was a Buddhist scholar, monk and philosopher, who lived between the 7th century and the 8th century. 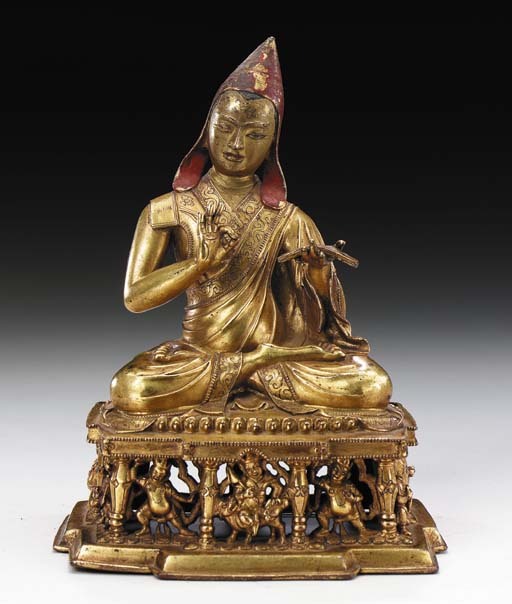 He is considered one of the 84 Mahasiddhas. Born a wealthy prince, Shantideva turned his back on the material world the night before he was to be crowned king. 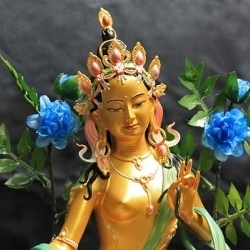 This extraordinary transformation blossomed from the teachings and advice of Manjushri. In line with those teachings, Shantideva became a monk at the prestigious Nalanda Monastery. 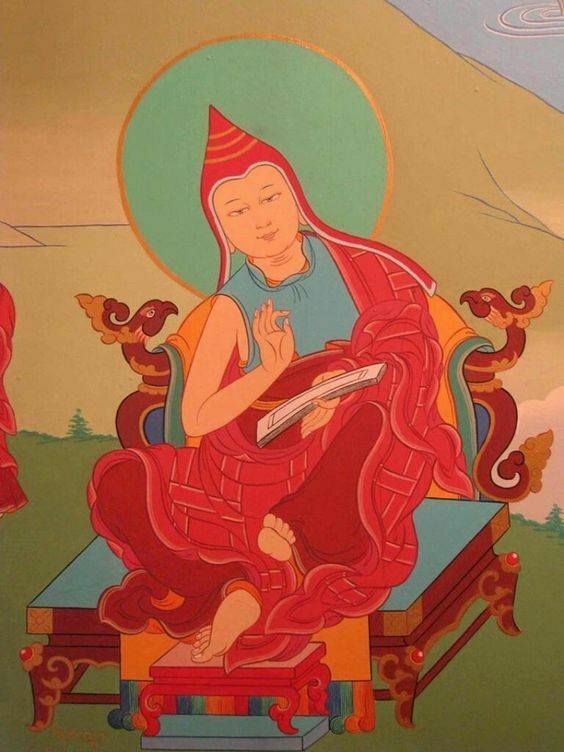 Shantideva immersed himself in study and contemplation. 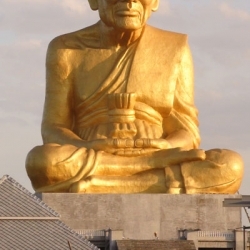 His sacrifice and perseverance laid a path that has guided countless others to Buddhism and continues to do so today. 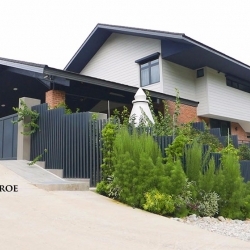 To this day, his teachings are still studied and revered by Buddhist scholars around the world. Most of what we know about Shantideva’s life comes from the writings of two Tibetan authors. They are Buton Rinchen Drub, one of the previous incarnations of Dorje Shugden, and Taranatha, a 16th-century lama of the Jonang school of Tibetan Buddhism. Researchers believe that a recently-discovered Nepalese manuscript from the 14th century could hold valuable new information about the life of Shantideva. 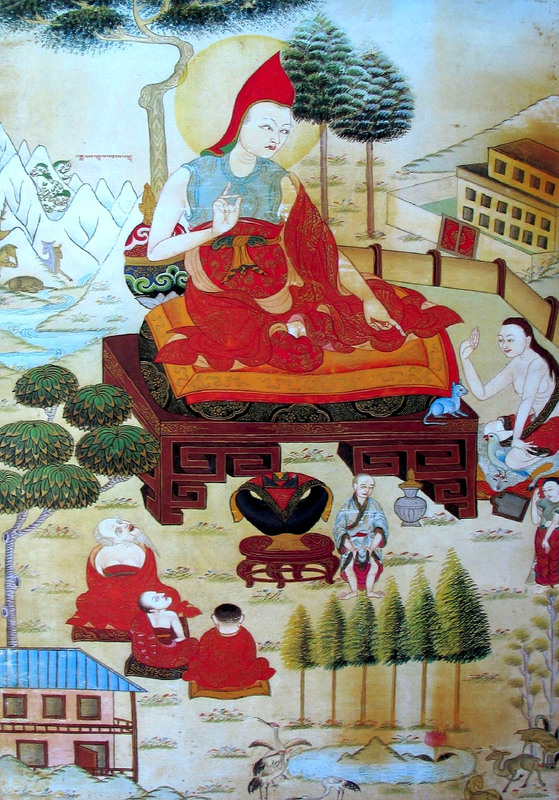 Most of what we know about Shantideva’s life comes from the writings of Buton Rinchen Drub (left), Taranatha (centre), and Shantarakshita (right). Click to enlarge or click here for more high resolution Buddha images. While these and other sources do speak of the events in Shantideva’s life, they seldom include dates. One of the few important exceptions is an essay written by Shantarakshita, the Indian Buddhist master who was the Abbot of Nalanda. In his essay dated 763 A.D., he attributes a passage to Shantideva. This crucial piece of the puzzle tells us that Shantideva lived between the late 7th century and the middle of the 8th century. 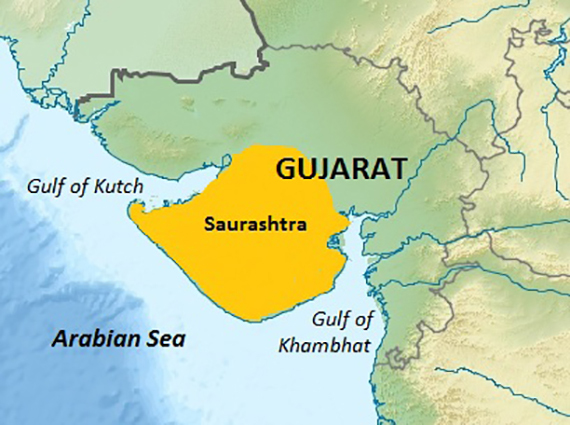 Shantideva was born under auspicious signs into the royal family of the ancient kingdom of Saurashtra, the present-day Gujarat state in India. He was the son of King Kushalavarmana (Armour of Virtue) and his wife who was an emanation of Vajrayogini. Shantideva was given the name Shantivarmana (Armour of Peace) at birth. Shantideva was attracted to spirituality and Buddhism from a very young age. When he was six years old, he had the fortune to meet a great yogi and practitioner of Buddhism. Shantideva’s purity of mind and trueness of purpose were rewarded with visions of Manjushri. Click to enlarge or click here for more high resolution Buddha images. The young prince received the Manjushri initiation from him and practised meditation diligently. His purity of mind and trueness of purpose were rewarded with visions of Manjushri and the Bodhisattva imparted teachings directly to Shantideva. These experiences moulded Shantideva into a child who displayed extraordinary intelligence, perhaps even the qualities of a Bodhisattva. He demonstrated philosophical knowledge as well as mastery of various arts and sciences. Respectful to his elders and compassionate to the less fortunate, the sick and the poor, Shantideva earned great respect from his parents and peers even at that tender age. Click to enlarge or click here for more high resolution Buddha images. Upon the death of Shantideva’s father, the ministers and the subjects of the kingdom requested that Shantideva succeed him to the throne. Although the young prince had no desire for power, fame and fortune, he did not want to disappoint his subjects and so he agreed to the coronation. The night before the ceremony, Shantideva had a dream that would change the course of his life. Manjushri was sitting on his throne and said, “My son, this is my seat, and I am your teacher. 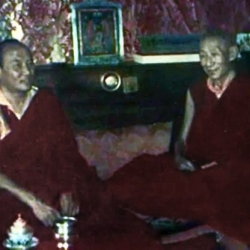 How can we [both] sit on the same seat?” [Source: chinabuddhismencyclopedia.com] Manjushri then advised him to become an ordained monk. Deciding to follow Manjushri’s advice, Shantideva fled the kingdom and left all his possessions and riches behind. 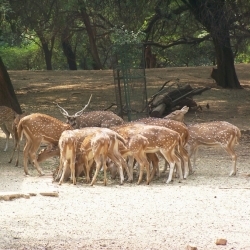 After fleeing the palace, Shantideva paused to meditate in a forest. Manjushri appeared and offered him a wooden sword. 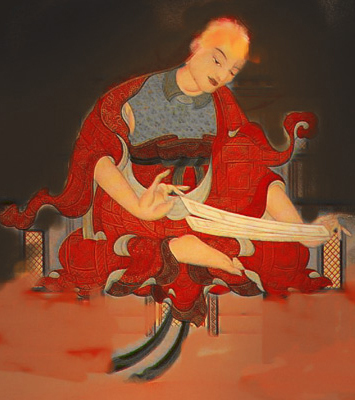 Upon receiving the sword, Shantideva achieved the eightfold realisation (i.e., right view, right intention, right speech, right conduct, right livelihood, right effort, right mindfulness, and right samadhi). 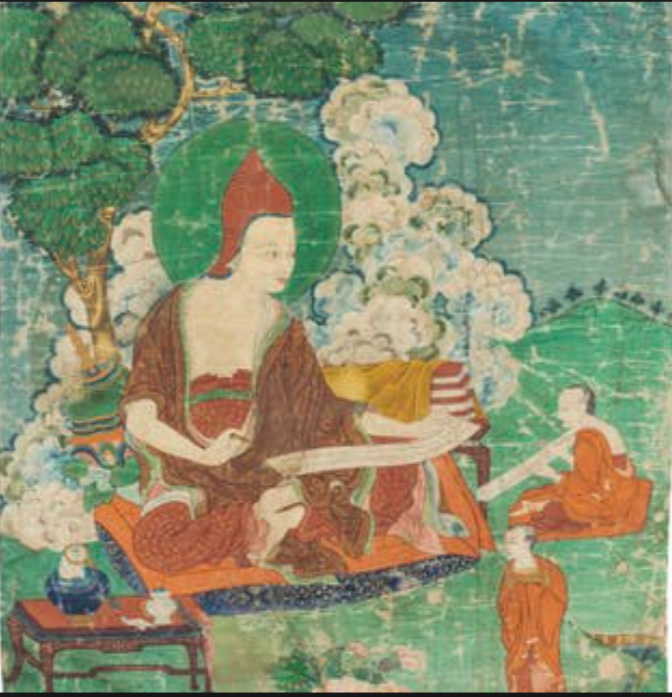 Shantideva then made his way to Nalanda Monastery. At Nalanda, the Abbot, Jayadeva (God of Victory) took the former prince under his tutelage. 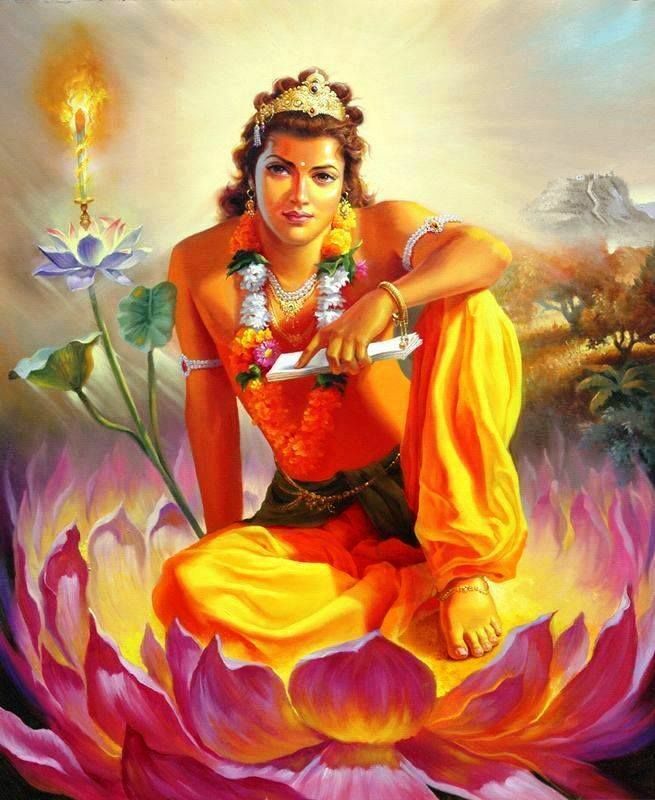 Jayadeva ordained him as a monk and gave him the ordination name Shantideva (the God of Peace). Shantideva continued to do his practice diligently and received the instructions and teachings on the Tripitaka directly from Manjushri. He contemplated the meaning of the Buddha’s teachings and composed the Compendium of Sutras and Training. Through deep focus and purity of intent, Shantideva attained the power of clairvoyance and a true realisation of the bodhisattva path. However, Shantideva did not inform anyone of these great accomplishments. The other monks ridiculed him, remarking that he only had three “special realisations”: sleeping, eating, and relieving himself. They gave him the nickname Bhusuku. Thus ‘Bhusuku’ alluded to Shantideva eating, sleeping and walking to the toilet. The monks considered Shantideva a disgrace to the eminent Buddhist institution because he was consuming the food from faithful sponsors and not doing his practice. They plotted to have him expelled but could not because he had not broken any rules. It was then decided that they would compel Shantideva to leave of his own accord. The idea was to ask him to teach in front of a large assembly of monks. They believed that Shantideva would be so embarrassed by his own ignorance that he would have no choice but to leave Nalanda. When Shantideva received this request from his peers, he refused out of humility. The monks were not dissuaded however, and asked Shantideva’s teacher to order him to teach. When he received the instruction from his teacher, Shantideva agreed at once. There are two versions of what happened next. According to the first version, the monks’ desire to humiliate Shantideva was so great that they built a huge high throne for him in the middle of an open field. An average person would not be able to climb up the throne without help. They invited every member of the monastery and people from the nearby villages to come to watch the spectacle. When Shantideva arrived, his arm stretched high and pressed down on the massive throne. The throne started to shrink, and Shantideva took his seat with ease. 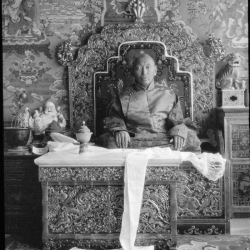 After Shantideva was seated, the throne returned to its original size. 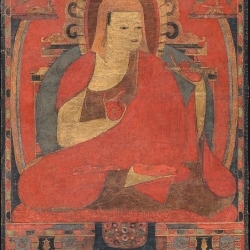 A painting of Shantideva from the 19th century. Click to enlarge or click here for more high resolution Buddha images. After some brief exchanges, Shantideva started teaching the Bodhicharyavatara from memory. It is said that many of the attendees saw the image of Manjushri above Shantideva’s head as he spoke. Everyone in the audience was awestruck. The monks realised that they had failed to recognise his attainments. But it was too late. Shantideva was gone. 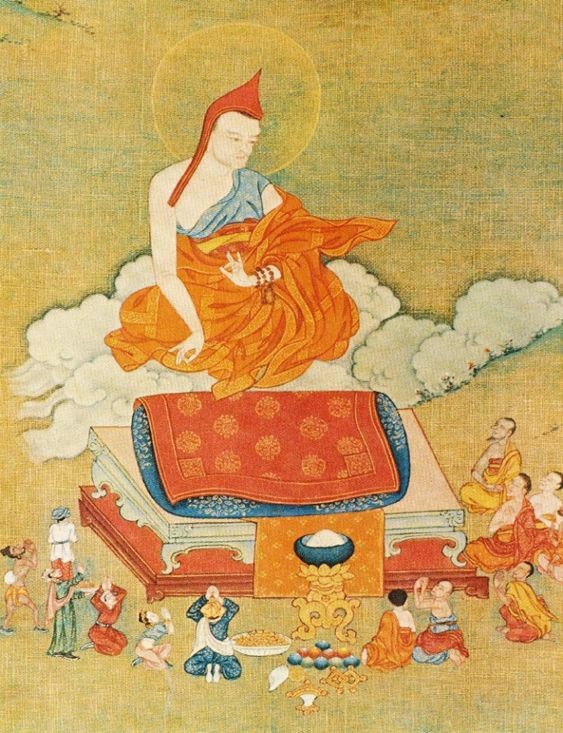 Shantideva started to levitate during his teaching session at Nalanda Monastery. Click to enlarge or click here for more high resolution Buddha images. The second version of the story says that the Abbot and Manjushri intervened to help Shantideva. It tells us that the monastery had a practice where monks took turns to sit on a throne and recite sutras. This was a voluntary exercise and Shantideva never participated. One day, Jayadeva, the Abbot, asked Shantideva to take his turn or risk expulsion. The other monks were elated – they had never seen Shantideva memorise any scriptures and relished the thought of seeing him humiliated. 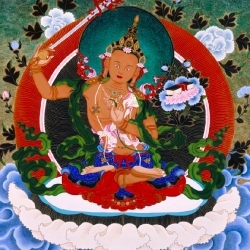 The night before the event, Jayadeva visited Shantideva’s quarters and advised him to recite Manjushri’s mantra. The Abbot also gave him the secret precepts of Manjushri’s sadhana. To ensure that he would not fall asleep as he tried to memorise the verses, Shantideva tied his collar to the ceiling. 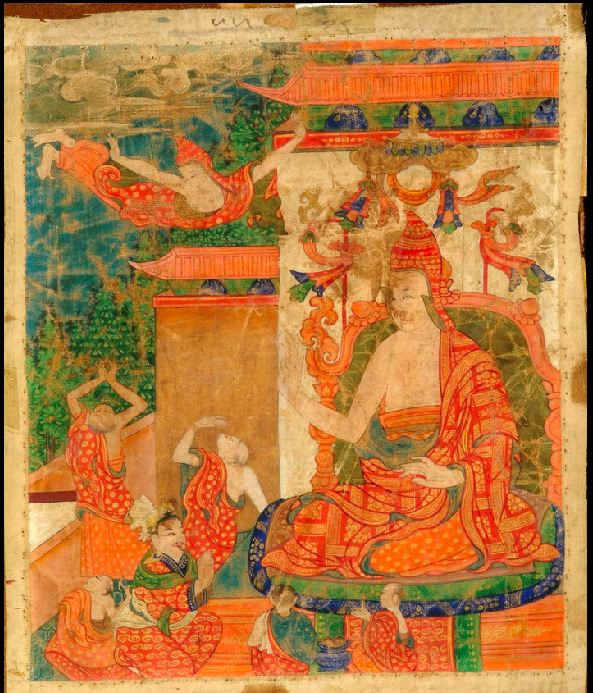 Another illustration of Shantideva levitating during his teaching session at Nalanda Monastery. Click to enlarge or click here for more high resolution Buddha images. Shantideva then realised that he was conversing with Lord Manjushri himself. He immediately pressed his palms together and requested realisation and the power of perfect insight. In the morning, when his turn came to give the teaching, Shantideva sat on the throne. Then, he started to levitate and his body blazed with an aura that inspired faith in everyone present. Then, Shantideva began a discourse of the Bodhicharyavatara. When he reached the tenth chapter, his body began to rise into the sky. After the discourse, the audience began to offer flowers at his feet. The other scholars asked Shantideva to give a commentary on the teaching and he obliged. After he delivered the discourse at Nalanda Monastery, Shantideva decided to travel to South India. Click to enlarge or click here for more high resolution Buddha images. After he delivered the discourse at Nalanda Monastery, Shantideva decided to travel to South India. After he left, the monks of Nalanda began to argue over whether Shantideva’s Bodhicharyavatara consisted of nine chapters or ten. The scholars from Kashmir claimed that Shantideva taught only nine while some Magadha scholars who had perfect memories recalled ten. In addition, none of them knew about the Compendium of Sutras and the Compendium of Training that Shantideva referred to in his teaching. It was decided that several monks would search for Shantideva and request that he repeat the discourse. 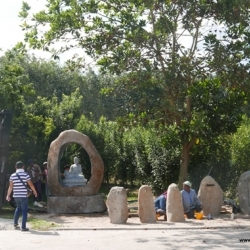 The monks finally found Shantideva near the Shridakshina Stupa in South India. They invited him to return to Nalanda but he refused. However, he did agree to repeat the teaching he had given there. Shantideva revealed that the Compendium of Sutras and the Compendium of Training were in his room at Nalanda Monastery. He had written the texts on palm leaves and secured them under the roof. 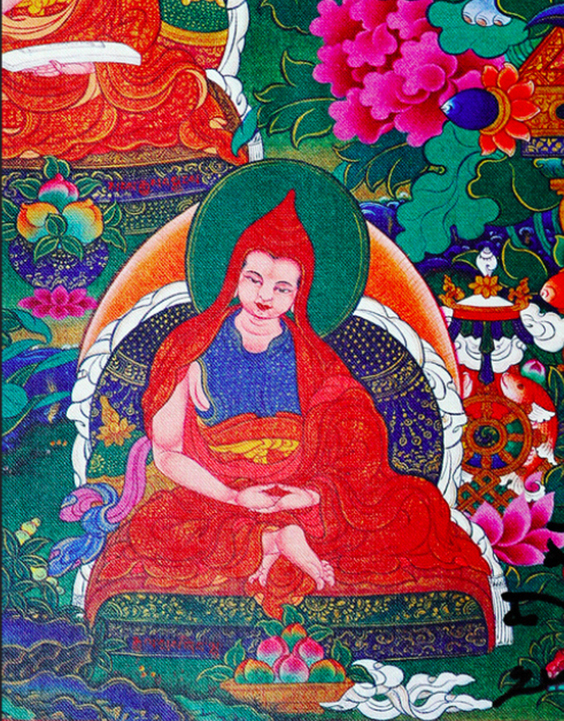 Thus, Shantideva’s reputation as a great teacher was sealed and his work flourished in Mahayana Buddhist lands. 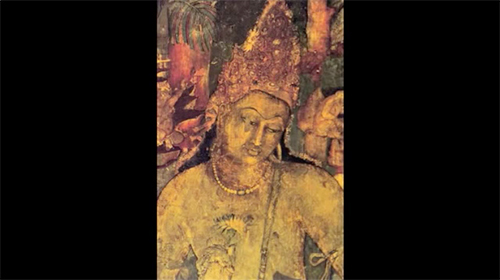 The Bodhicharyavatara was written to show the true path of a Bodhisattva and all beings in general. The lineage of the Bodhicharyavatara that was passed down from Manjushri to Shantideva eventually was passed down to Suvarnadvipa Guru (Serlingpa), Atisha Dipamkara Shrijnana’s teacher from Sumatra. 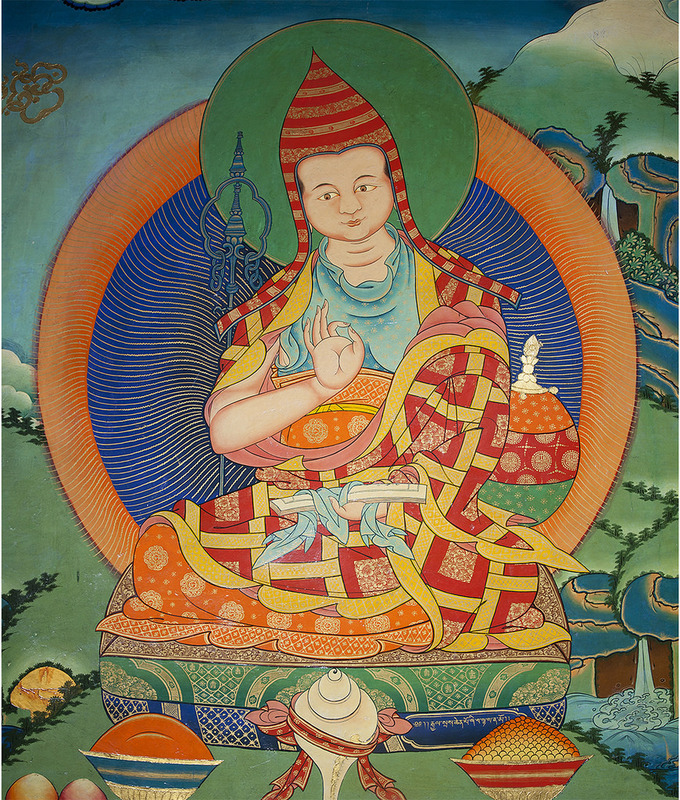 Atisha received the practice from Serlingpa and passed the teachings to Kadampa lamas. The instructions went through a succession of teachers, including Lama Tsongkhapa who passed it down to many Gelug masters. After leaving Nalanda Monastery, Shantideva worked to ease suffering wherever he went. Besides teaching, he is also known to have performed many miracles. Here are some of the most remarkable stories. One day, through his clairvoyance, Shantideva predicted that if he was to help a certain king, many people would get help. 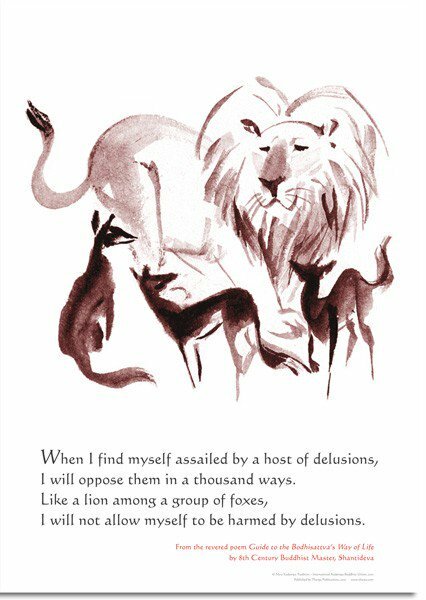 Therefore, Shantideva visited the outside of the king’s palace and noticed a crowd of unappeasable people. 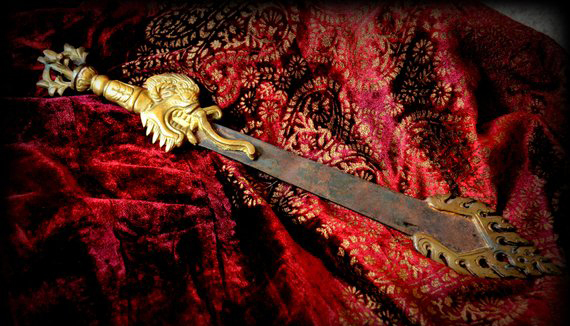 Armed with a wooden sword painted in gold, he applied and was accepted for a position as a palace guard. The king was very wealthy, but these riches caused him distress and anxiety. Shantideva served the king faithfully for several years. During this time, Shantideva overpowered those with evil intent and gave the king and his subjects peace of mind. 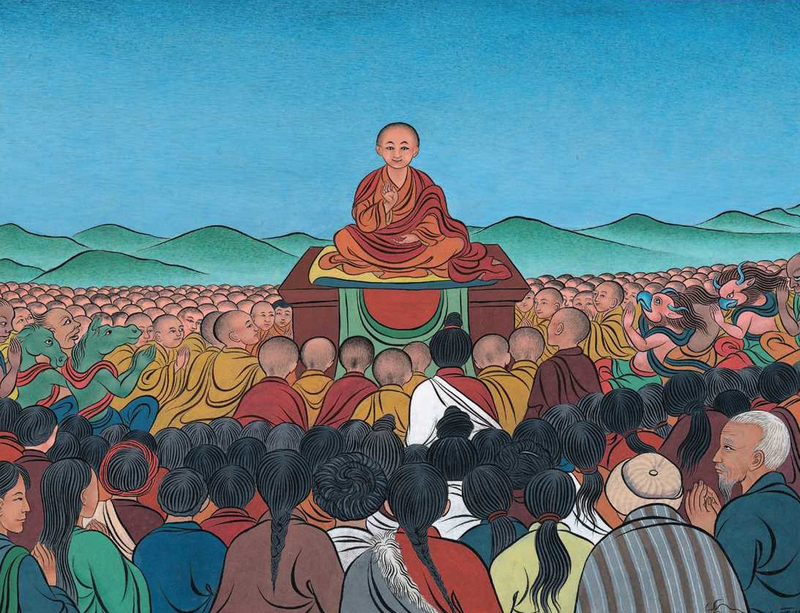 The king and his subjects respected and had faith in Shantideva. However, one man who was jealous of the king’s affection for Shantideva reported to the king that Shantideva had been deceiving the king and that his sword was made of wood. 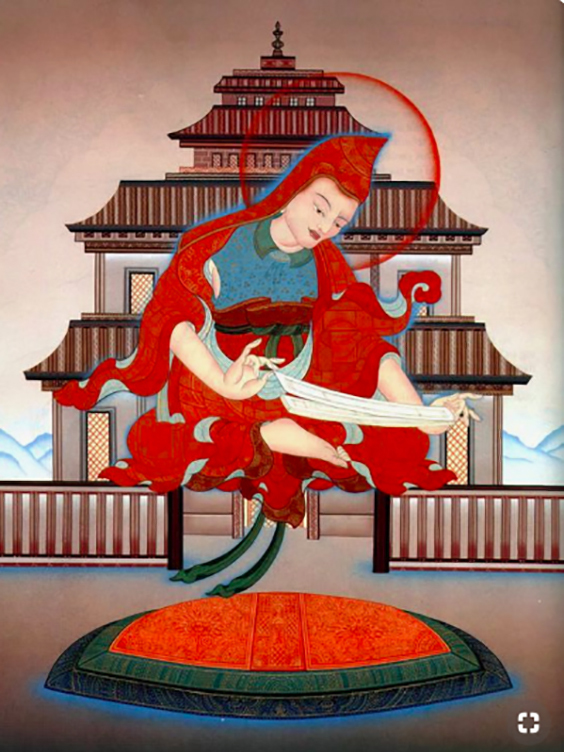 The king ordered Shantideva to show his sword. At first, Shantideva refused. 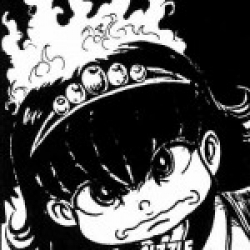 He warned the king and everyone present of the harmful consequences of showing his sword. However, the king insisted. Shantideva warned everyone to close or cover one eye. When he unsheathed his sword, the intense light of ten suns filled the room, and every unprotected eye went blind. The people fell on their knees and begged for Shantideva’s forgiveness. Shantideva rubbed his saliva on their eyes and sight was restored. The king and his subjects developed great faith and took refuge in Shantideva. While Shantideva was in South India, the region was struck by famine. 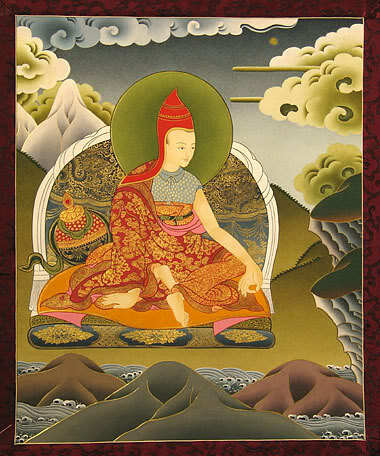 Shantideva announced that he would help to relieve their suffering through an act of generosity. The next day, many people gathered to see what he would do. 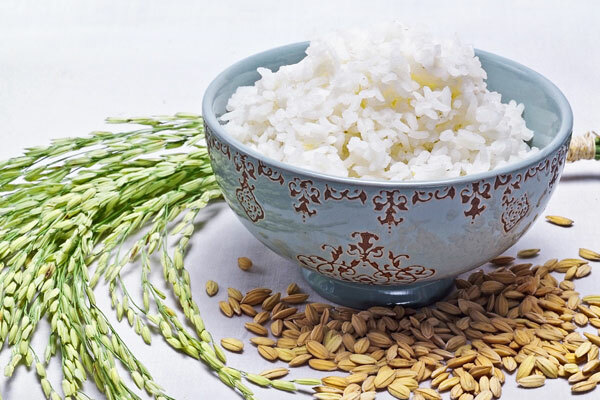 Shantideva produced a single bowl of rice and used it to feed everyone who was there. This miracle brought many people to Buddhism through the faith they developed in Shantideva. 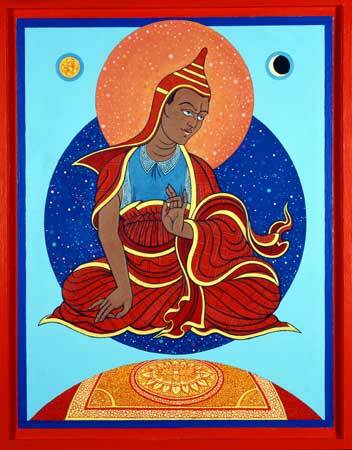 Shantideva continued to touch the lives of people wherever he went and he earned great fame. Many non-Buddhist masters were jealous of his abilities, including one of the most well-known non-Buddhist teachers at the time, Shankadeva. Shankadeva challenged Shantideva to a debate and the latter accepted. 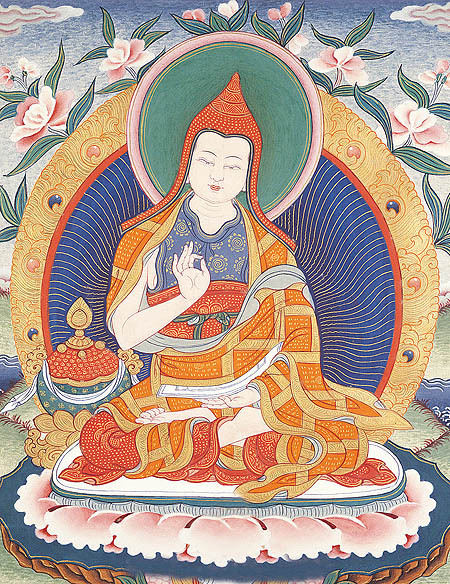 Shantideva emerged victorious through the use of miracle powers and logic. So persuasive were his arguments that even Shankadeva and his disciples converted to Buddhism. 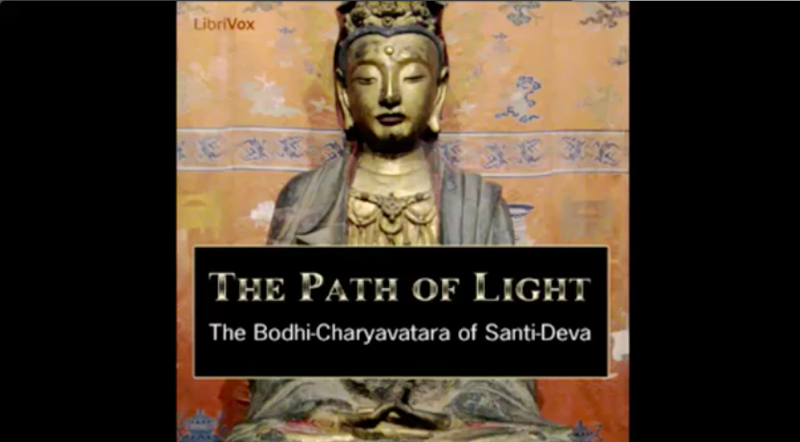 Another account tells us how Shantideva saw, through his clairvoyance, that there was a region where the time had ripened for the non-Buddhists who lived there to be introduced to the Buddha’s teachings. 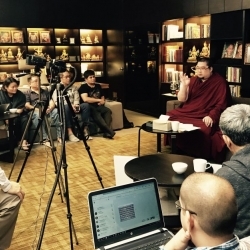 In this region, there was a non-Buddhist teacher who challenged Buddhist masters to debate. However, no one was able to accept the challenge. 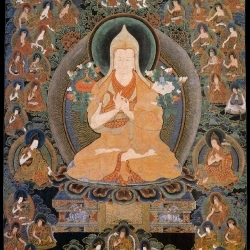 A thangka of Shantideva from between the 18th century and the 19th century. Click to enlarge or click here for more high resolution Buddha images. Shantideva went to this region disguised as a beggar. One of the king’s attendants met with Shantideva and noticed something unusual. There were drops of water that fell on Shantideva but the moment the water touched Shantideva’s skin, they started to boil. The attendant reported the incident to the king who then asked Shantideva for help. 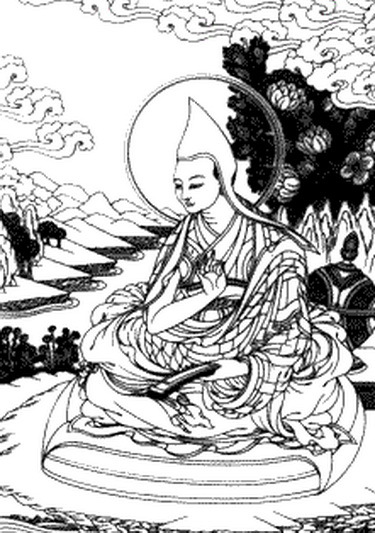 As a result, Shantideva accepted the non-Buddhist master’s challenge. On the designated day, the king and his subjects watched as Shantideva’s extensive knowledge and power of reasoning reduced his opponent to silence. The non-Buddhist master tried to invoke the power of his god to help him. However, even before he managed to complete the invocation, Shantideva meditated on the wind element and caused a massive storm. The king, his consort, and the whole assembly ran to protect themselves while the non-Buddhist teacher was caught in the hurricane and became powerless. Then, the sky darkened. From between Shantideva’s eyes, a ray of light appeared in the direction of the king and queen. Shantideva bathed them and replaced their ripped clothes. They were put near a fire to warm themselves. After witnessing the power of Shantideva, the king, the queen and their subjects developed faith in him. Throughout his life, Shantideva displayed tremendous dedication to helping living beings without any care for worldly concerns himself. 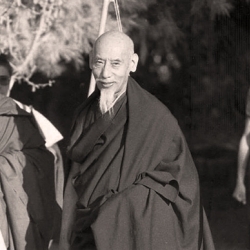 His selfless actions introduced countless people to the Buddha’s teachings. Although it is not clear when Shantideva passed away, it is said that he served sentient beings in human form for 100 years before entering clear light. Even today, the story of Shantideva continues to inspire many and is popular among children and adults. 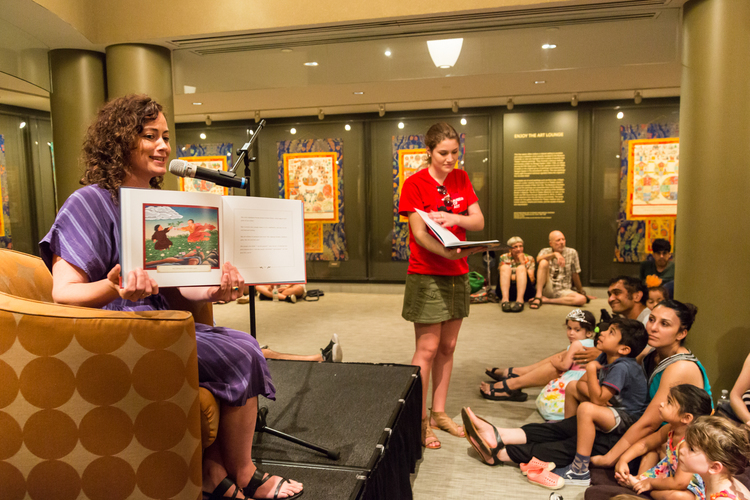 Dominique Townsend reads from her children’s book “Shantideva – How to Wake up a Hero,” at Rubin Museum Block Party. Credit – Lyn Hughes. The following is one of H.H. 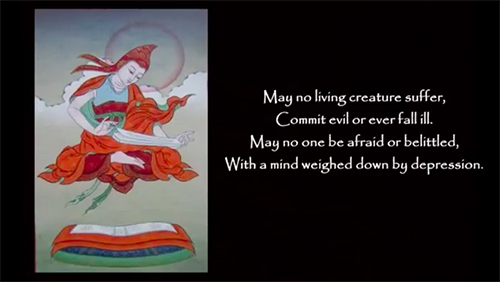 the 14th Dalai Lama’s favourite dedications, extracted from Chapter 10 of the Bodhicharyavatara of Master Shantideva. And the people think of benefiting each other. 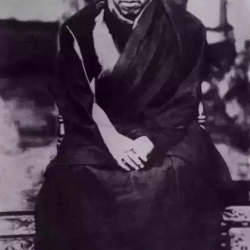 Rinpoche, Pabongka. ‘Liberation in the Palm of Your Hand’. 2nd edition. Somerville, MA. Wisdom Publications, 3 November 2006. Geshe Kelsang Gyatso, ‘Meaningful to Behold’, 5th edition. Chippenham, Wiltshire, Tharpa Publications, 2012. Rinpoche, Tsem. 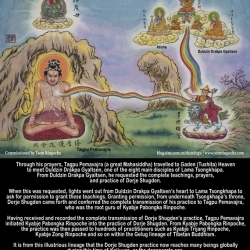 ’84 Mahasiddhas’ tsemrinpoche.com [website], https://www.tsemrinpoche.com/tsem-tulku-rinpoche/buddhas-dharma/vajradhara-and-84-mahasiddhas.html (accessed 24 September 2018). 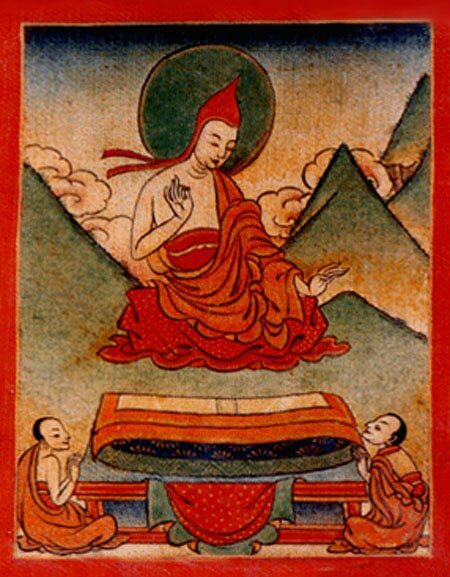 ‘Shantideva’, Wikipedia: The Free Encyclopaedia, 26 August 2018, [website], https://en.wikipedia.org/wiki/Shantideva (accessed 24 September 2018). 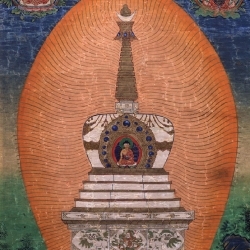 ‘Shantideva’, Rigpa Shedra, [website], http://www.rigpawiki.org/index.php?title=Shantideva (accessed 24 September 2018). 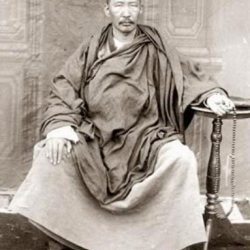 Shenphen, Khenpo, ‘The Life of Shantideva’, http://dharmakaya.org/eventdocs/malaysia/1275657141.pdf (accessed 24 September 2018). ‘Shantideva’, Bodhicharya, [website], https://bodhicharya.org/shantideva/ (accessed 24 September 2018). ‘Santideva’, Stanford Encyclopaedia of Philosophy, 19 September 2016, [website], https://plato.stanford.edu/entries/shantideva/ (accessed 24 September 2018). Sherab, Stanzin. ‘Shantideva: The Lazy Monk Who Became a Hero’, Siddharta School Project, https://siddharthaschool.org/shantideva-hero-monk/ (accessed 24 September 2018). ‘Shantideva’, Chinese Buddhist Encyclopaedia, http://www.chinabuddhismencyclopedia.com/en/index.php/Shantideva (accessed 24 September 2018). Rinpoche, Lama Zopa, ‘Shantideva’s “A Guide to the Bodhisattva’s Way of Life”’ Lama Zopa Retreat 2018, http://lamazoparetreat2018.org.au/shantideva-gtabwol/ (accessed 24 September 2018). Thank you very much to the writers and Rinpoche, for bringing much more information about Shantideva. A lot of the information out there were about how Shantideva was cornered into sharing the Buddha Dharma, and then he left the monastery. Much less common was the stories of what Shantideva accomplished after he left the monastery. It was interesting to read that the ‘Bodhicharyavatara’ was the teaching transmitted from Manjushri to Shantideva, then to Atisha and down to the Gaden tradition. 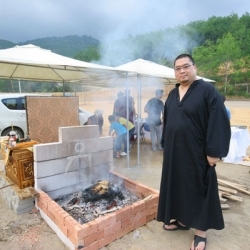 Whenever I participated in Kechara Soup Kitchen’s activities of going to serve and feed the homeless, the group of volunteers will recite Shantideva’s prayer as shown in this article and I was always inspired by the great compassion evoked in these prayers. Reading the story of Shantideva showed me to realise the meaning of Bodhichitta, the ultimate altruism. 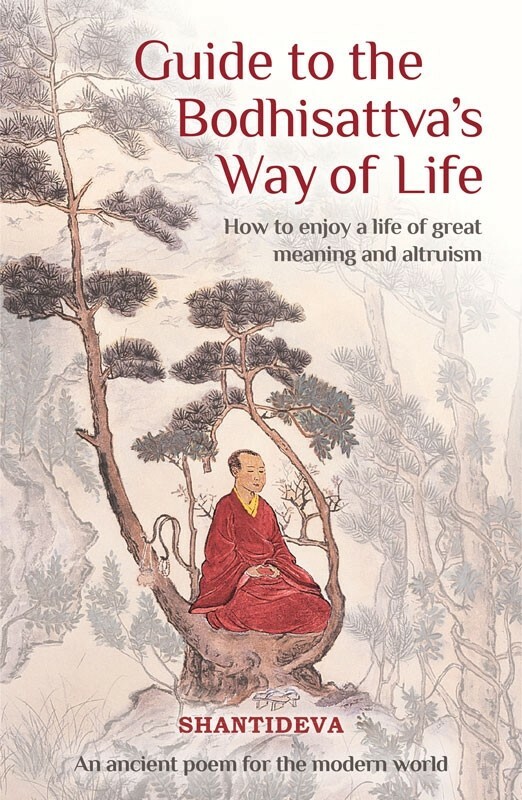 At my current low level practice, learning of the teachings of Shantideva in Guide to the Bodhisattva”s Way of Life (Bodhicharyavatara) will inspire my first step to gaining a mind of altruism to benefit others and myself. I really enjoyed reading about the Buddhist scholar, monk, and philosopher Shantideva. I admired how he born into wealth and was to be crowned King, turned his back on the material world. Shantideva was one of the 84 Mahasiddhas and rightly so. 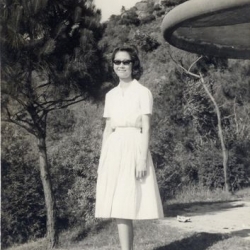 Shantideva was very lucky to receive and practice meditation at a really young age. He had a very close relationship with Manjushri. Thanks to Manjushri he decided to become a monk. It’s sad he was ridiculed by other monks, but he proved them wrong when he gave his discourse on the Bodhicharyavatara and levitated. 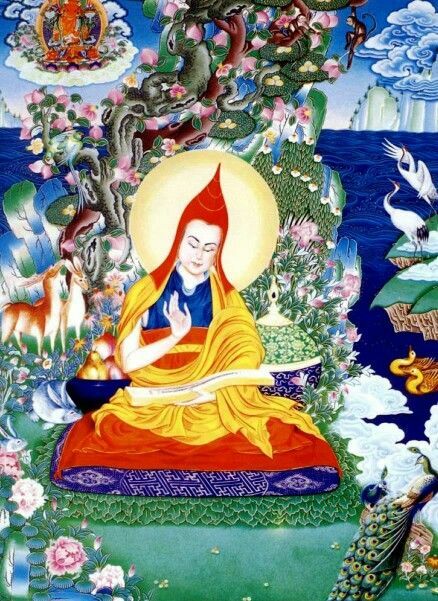 Shantideva showed other miracle abilities over his lifetime and helped many beings. His famous debate with the non Buddhists left all of them in silence. He showed his keen insight, knowledge and logic. He brought many beings to Buddhism. At the end of his lifetime somewhere around 100years, he entered clear light. He is definitely an inspiration for all to follow.